As you know, magnetic resonance imaging (MRI) is an indispensable diagnostic tool for the daily work at a clinic. In fact, 3 out of 4 of your patients will need an MRI in the next 10 years. This is why MRI safety should be such an important factor in choosing a hearing implant. If an implant isn’t designed for safe MRI scans, it can be difficult or almost impossible for radiologists to perform an MRI scan. This is why all MED-EL hearing implants are designed for MRI scans of at least at 1.5 Tesla—without any need for additional surgery. We’ve already looked at the MRI safety of our cochlear implants, but today we’re going to hear how our middle ear and bone conduction implants deliver MRI safety. Users of the VIBRANT SOUNDBRIDGE (VORP 503) and BONEBRIDGE (BCI 601) can be safely scanned at 1.5 Tesla. Both implants utilize a secure, force-balanced magnet, so there’s no need for surgical magnet removal, and there’s no need for a rigid splint or head bandaging. Today, Prim. Dr. Thomas Keintzel is sharing his experience with us. 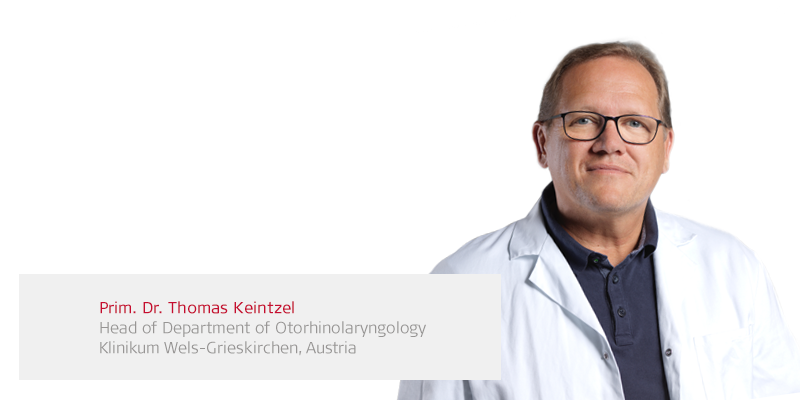 Dr. Keintzel is head of the ENT department at the clinic Wels-Grieskirchen in Austria. Many of his SOUNDBRIDGE and BONEBRIDGE patients have already had an MRI. Let’s go over to Prim. Dr. Keintzel to hear his experiences with MRI and these hearing implants. MRI is an integral part of routine radiological diagnostics. This means that it is very likely that a patient will need an MRI during their life. Considering this fact, it is very important that implants—also hearing implants—are chosen based on their MRI safety. At our clinic, we do MRIs according to the instructions of the respective implant manufacturer. In some cases, there is also a collaboration with local radiologists who do the scanning according to the guidelines. The MRI safety & compatibility of a hearing implant definitely affects our decision making. The indication for an MRI is quite broad. In orthopedic cases they are often required. At our clinic, the surgeon who performed the implantation is consulted before the MRI. Then the scan is done following the protocol. The scans that we have done so far with SOUNDBRIDGE and BONEBRIDGE all ran very smoothly without any complications or pain. Patients are usually nervous before their MRI, because they are afraid that the scan could cause pain. But their worries can easily be resolved by an informative discussion with the patients. When doing a head scan with a BONEBRIDGE, you should expect an image shadow or artifact of about 12 cm [note: artifacts with MED-EL cochlear implants are significantly smaller]. 1.5 Tesla MRI with VIBRANT SOUNDBRIDGE VORP 503 Middle Ear Implant. 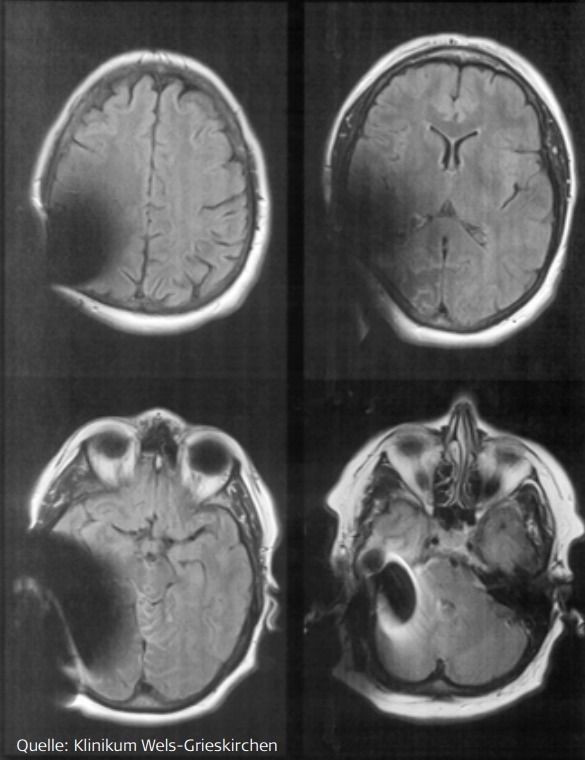 In unilateral cases, you can often still see the cerebral structures quite well if you use special sequences. This is a lot more difficult with bilaterally implanted patients. When it comes to informing radiologists and assistants in how to handle hearing implants—whether it’s active implants or passive prostheses—there is still a lot that can be done. I regularly hear of patients who were not accepted for their MRI scan by the local radiologists even though they had an implant identification card for MRI. The local radiologists request evidence from the clinic that the implant is safe to be scanned. But such evidence can only be provided by the manufacturing company. Regular trainings for the radiology technologist, organized by the implant manufacturing companies, would surely help. Thanks Prim. Dr. Keintzel for sharing your perspective! Want to hear more about MRI with a MED-EL hearing implant? Check out this interview with a recipient who had a 1.5 Tesla MRI with her SOUNDBRIDGE. Looking for full MRI conditions for MED-EL hearing implants? Visit our Important Safety Information page for a full guide to medical imaging with each implant. You can also check out these step-by-step instructions to see how to perform an MRI scan with SOUNDBRIDGE and BONEBRIDGE. Do you have questions on the MRI conditions of SOUNDBRIDGE and BONEBRIDGE? Contact your local MED-EL representative or use our simple contact form!